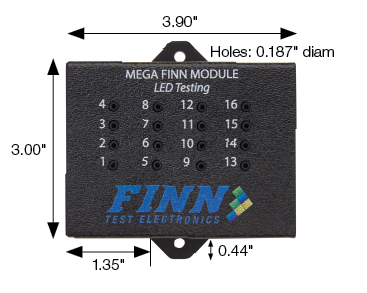 The Mega FINN Module combines all of the accuracy and speed found in the Mega FINN with an easy to use, compact module for testing larger quantities of LEDs. No cutting fibers/polishing: 18” or 24” fibers with custom heads assembled in one piece. Fibers come with the module. 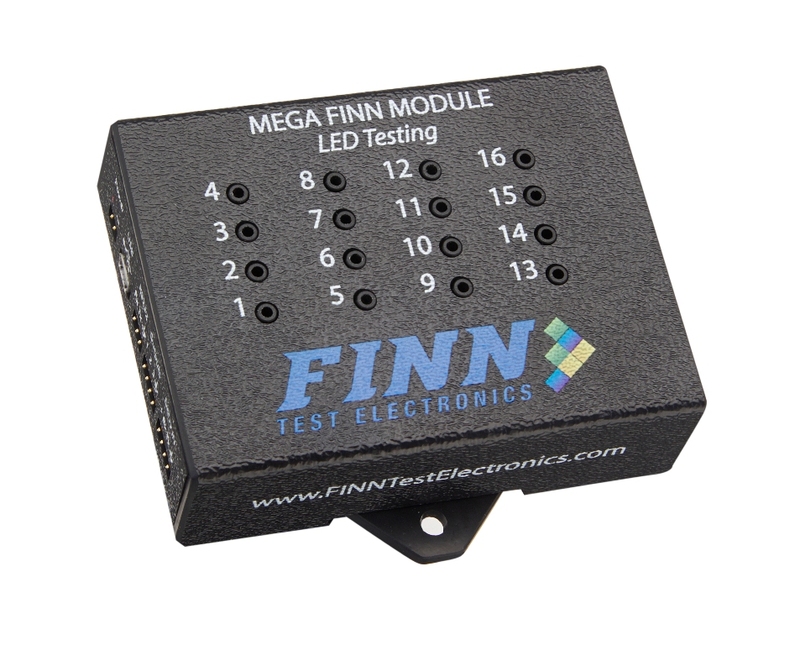 The Mega FINN™ Module utilizes the technology and advanced LED color and intensity measurement capabilities of the Mega FINN™ sensor packaged in an enclosed housing to allow simultaneous testing of multiple LEDs, without having to power up each component individually. This cost- effective method of our light intensity detector determines the presence, color and/or brightness of LEDs, which enables users to test large quantities while minimizing fixture considerations and lowering per unit costs. on the opposite end which is placed in front or on top of the LED to be tested. When a command for a specific numbered cable is sent to the module, the module will measure the color and/or intensity of the requested cable and send back the measurement via the chosen interface. Readings may be provided in either frequency (Hz) or in voltage (V) for the LED color and in voltage (V) readings for the LED intensity. High accuracy of +/- 0.3% and average resolution of 0.1nm across the visible spectrum. Fast response time – typically less than 3 milliseconds for average to bright LEDs. Quick and easy installation with the flexibility of either a USB or Serial connection with built-in over-voltage protection. Compact module is easily mounted in an ICT fixture or Functional test station. When test requirements call for the absolute fastest test time possible. When quality control demands reliable, unerring accuracy and when clear cut measurements are vital. For pulsing, bright to very dim LEDs – visible light from Ultraviolet to near infrared. Functional and In-circuit test environments, on any test platform. For use in testing multiple LEDs and excellent for large quantities of LEDS. 5-16 volts DC. Current is typically ~100mA for 16 channels module. USB – plug in cable and align fiber optic in front of LEDs. 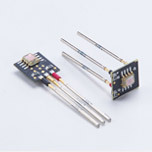 Module utilizes the 5 volts provided by the USB itself, no external power supply is needed. The USB virtual COM port driver causes the USB device to appear as an additional COM port available to the PC. 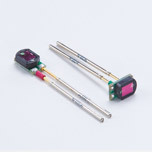 Serial – power, ground, transmit (Tx) and receive (Rx) wires are wire-wrapped to PC or test fixture connection and fiber optics aligned in front of LEDs. 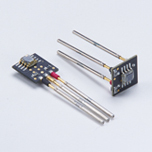 5v to 16v power supply is required. 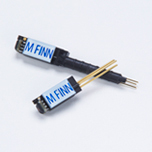 Optics - the Mega FINN Module has two fiber optic options available – an 18" cable assembly and a 24" cable assembly. The press fit plug end of the cable assembly fits. into the number labeled socket in the top of the module body. 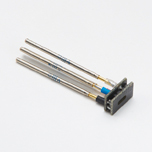 The metal shrouded end of the cable assembly is placed in front of or over the LED being tested. It may be held in place by a drilled 50 mil hole in the top plate or a drilled block of a fixture so that the opening is centered over the face of LED. 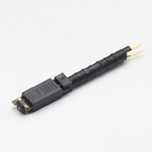 Each module includes fiber optic cables with custom heads.